Look around the world for a minute: You’ve got the Iran nuclear deal, North Korea and the U.S. embassy in Israel moving to Jerusalem. You’ve got Russians in your Facebook feed and Pakistan and India continuing their 60-year standoff. It’s one thing to read the headlines, to even read smart, well-written articles. But to untangle a complicated world stage, it’s nice (and rare) to be able to find someone to address it all. 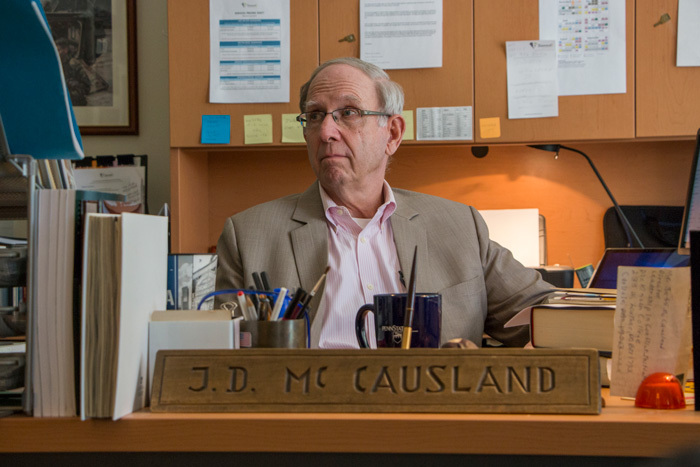 Enter Jeff McCausland, visiting professor of international security studies and former Distinguished Visiting Professor of Research and Minerva Chair at the U.S. Army War College’s Strategic Studies Institute. A U.S. Army colonel (retired), McCausland served in a variety of command and staff positions in the U.S. and Europe, including serving in the Office of the Deputy Chief of Staff for Operations; commanding the 3rd Battalion 17th Field Artillery, VII Corps during Operations Desert Shield and Desert Storm; and serving as director for Defense Policy and Arms Control on the National Security Council Staff in the White House. McCausland recently returned from Thailand, where he participated in a series of high-level discussions on nuclear counter-proliferation/nonproliferation. The talks focused on the ongoing tension that exists between the two nuclear powers in South Asia—India and Pakistan. Discussing the trip became a wide-ranging exploration of the world stage as it now stands. Q: Tell us about your recent trip to Bangkok: Why you, why now? A: I've worked a lot on arms-control issues and nuclear weapon issues. I did that in the Pentagon, in operational assignments and when I was on the National Security Council staff in the White House. So the last few years I have been approached by an organization called the National Nuclear Security Administration, part of the Department of Energy. They do a lot of things on nuclear security for facilities for weapons, and they do a lot of programs, seminars on counter-proliferation of nuclear weapons and nonproliferation of nuclear weapons and other weapons of mass destruction, such as chemicals and biological weapons. I have traveled quite broadly around the world to attend workshops and seminars involving what are called in the parlance “track two” discussions, which are meetings between representatives from two or more countries. It’s normally people who are either in government working on the issues, people who are formally in government or retired military like myself who have experience and knowledge in these areas as well as academics who have a particular expertise on the topics to be discussed. These most recent discussions took me to Bangkok as part of an American team to meet with two teams from India and Pakistan for track two discussions about crisis management in South Asia. Q: You said the group had a “frank exchange,” and the discussions went well, but you also said it’s unlikely these particular track two discussions would lead immediately to more advanced track one talks. So what's it going to take between these two countries? A: Unfortunately, one thing it could take is another conflict, and they've had three or four since the inception of India and Pakistan in the late 1940s. Luckily, so far none of those have escalated to the use of nuclear weapons. So a major crisis, and hopefully not a war, could bring them to the point where they decide they have to negotiate and move away from the possibility of future conflict. On the other side, more benignly, or more hopefully, would be outstanding emerging leadership on either side that was forthcoming enough to take what would be significant political risks on their own part. Because this conflict, or at least semi-conflict, between India and Pakistan is so deep that I think leaders on both sides have been a little unwilling to reach across the line and take some risks, make some concessions, because they have believed in past that it would hurt them dramatically. They’d need some amazing leadership on the part of Pakistan or India, where you have in the future a leader who is willing to take the risk, make a gesture, make an offer to try to break through the ice that has left these two nations in crisis for decades. Something like an announcement of a summit of the two leaders with at least a minimum goal to establishing enhanced measures to control crisis management, to begin to discussion of arms control arrangements or so-called confidence-building measures that reduce the possibility of conflict. Not unlike we, the United States, had with the Soviet Union during the Cold War. Q: How different would the situation be if these two countries did not have nuclear weapons? A: In my opinion, they would have very likely gone to war again by now. North Korea, Nuclear Program and Upcoming Talks With the U.S.
Q: Switching gears, why is North Korea doing what they're doing right now? A: Let's define doing what they're doing: First, why are they acquiring a nuclear weapon? Because for them, it's the ultimate life insurance policy. They believe that the possession of nuclear weapons will preclude the United States from attacking them, which they still fear. I think unfortunately many people make the mistake of characterizing Kim Jong Un as being crazy, and I don't think he’s crazy at all. I think he's ruthless and brutal beyond a doubt. But he understands the one thing that all dictators understand: What’s it going to take for me to survive, for my regime to survive, for there to be a high probability that I can pass on control of this country to my children and die as a very old man quietly in my be? That's what all dictators want and think about. He came to power in 2011, which was the same year that Muammar Gadiffi was deposed and killed. His demise was widely covered in the North Korean press since the Libyan leader had given up his nuclear weapons program in return for the elimination of economic sanctions. With that in mind, having a nuclear weapon is not so much because he's anxious to attack Los Angeles or wherever, because he would realize that to do so, even if he was successful, would be the end of him, his family and his regime. But Kim’s nuclear weapons remain the world's “greatest life insurance policy” against keeping us from “visiting” him. It's arguable that he has achieved what he wanted—the development of a nuclear weapon and the capability to deliver that over long ranges to include potentially threatening American territories. Now, when I say it appears he may have that capability, it's still unclear because they'd never tested a weapon at that range. The next question is, if you were Kim why would you want to negotiate about this? Well, to some degree, probably the sanctions that have been put in place have continued to bite the North Koreans pretty hard, and their economy is certainly lagging far, far, far behind their South Korean cousins. So now Kim sees the opportunity to negotiate and over time hopefully do what he says he wants to do, which is improve the state of his economy. Now, I don’t think he's doing that because he's terribly concerned about is population, but he does know he's got to improve the North Korean economy to maintain some level of long-term contentment—and second of all, have a capacity to maintain all his military forces at a relatively modern level, and that's pretty difficult to do based on all the economic sanctions. In essence, we are attempting to convince Kim that in the 21st century he will be more secure without nuclear weapons than he is now with nuclear weapons. And finally, he's achieving the other thing that his father and grandfather always wanted: international recognition. A meeting with the president of the United States provides Kim Jong Un the international recognition and legitimacy that he and his forebears have sought since the creation of North Korea as a separate country in the aftermath of the Second World War. So to him, this is the ultimate prize. My biggest concern about this is our administration keeps throwing around the word “denuclearization.” Like Mr. Trump's going to show up and Kim Jong Un is going to turn over all his nuclear weapons immediately. And I just think that is very, very, very unlikely. I think the best one could expect coming out of this particular negotiation would be some agreement to begin a more formalized track, one negotiation in a very step-by-step fashion that reduces their stockpile. In return for that, a proviso for either economic assistance or reduce sanctions, but in a very, very gradual fashion. The Trump administration seeks to “frontload” these negotiations, whereby the North Koreans would give up their nuclear weapons in return for subsequent talks about economic development and the elimination of sanctions. The North Koreans want to “backload” the process, whereby the final elimination of their nuclear stockpile might not occur for many years. But if the administration keeps talking about immediate unilateral denuclearization and you’re North Korea, why would you show? Furthermore, the U.S. talks about the denuclearization of North Korea. The North Koreans keep talking about the denuclearization of the Korean peninsula, which would imply that U.S. troops and bases would be likely removed from South Korea. Q: How much did Donald Trump have to do with the possible transformation going on in North Korea right now? A: All presidents of the United States have an awesome responsibility on their shoulders. So I always say, look, they should get credit for the good things that happened while they're in office because they sure as heck are going to get credit for the bad things that happen. So Mr. Trump should get some credit for taking what I think is an enormous risk in agreeing to this particular summit. But credit for what? Nothing has happened. Nothing has happened except there's a possibility of a meeting. And the North Koreans released three American hostages. That's nice, but those people were being held for inconsequential reasons, and they've been basically ransomed as if they'd been picked up by criminals. So this loose talk about Nobel Prizes and all this kind of stuff is way out in front and pretty inappropriate. But at the same time, the president has done the following, and I'll give him credit for this: For the last 70 odd years we've had a succession of American presidents, Democrat and Republican, who have all said the situation in the Korean peninsula cannot be sustained and is intolerable and we cannot allow North Korea to get nuclear weapons. And despite all that rhetoric, what is changed? Nothing. Except the North Koreans now have nuclear weapons. The current president of the United States has come along and taken a pretty significant risk in saying, “OK, we're going to change the whole calculation and see if that allows us to break through what has been 70 years of frustration.” I think changing the calculation is what's going to be required if you're going to have any success. But the real danger is normally a summit like this between two world leaders is what happens at the very end, after a long period of negotiation. Then the two leaders meet together, usually to iron out the last few knotty issues, and sign an agreement. We're doing it at the beginning. Consequently, if the summit doesn't work, what do you do next? You've played your last card. So at that point you have really only a couple of options. You can say, “You know what? We’re not terribly happy that the North Koreans have nuclear weapons. Not terribly happy that Pakistan and India have nuclear weapons. Wasn't too crazy about the Soviet Union. But we’ve determined over time we can live with that and build up an arsenal that would defend the United States and its allies from aggression and deter potential enemies.” You could do that, or you can take military action. Say, “OK, we're going to take your nuclear weapons away from you, neutralize you as nuclear power.” The cost of that would be tens if not hundreds of thousands of dead—not only in North Korea but certainly in South Korea, to include the roughly 28,000 U.S. military personnel on the Korean Peninsula and somewhere around a quarter of a million Americans that live and work in Japan and South Korea on any given day. Or, finally, you can say, “Well, I don't like the fact they have nuclear weapons, but I guess for the short term I'm going to tolerate it and I'm going to continue to squeeze them with economic sanctions every way I can until such time as either the regime suddenly comes to its senses and decides it wants to show up and unilaterally give them all away.” I don't think that'll happen. Or we squeeze them to the point that we get such unbelievable unrest amongst the civilian population resulting in internal unrest and eventual regime change. I don't see that happening either. I think Trump and others think that they're already at that point now where [Kim] is going to give them up. Q: How much of Kim Jong Un’s backing away from his nuclear program was influenced by what happened to Muammar Gaddafi and Saddam Hussein? A: A lot. Kim Jong Un came to power about the same time that Gaddafi announced the unilateral ending of his nuclear program and our having access to it in return for the removal of economic sanctions. This was widely touted, this great unilateral move on the part of Libya. John Bolton [national security advisor], for example, and other advisors as well as Mr. Trump, have continued to use the Libyan metaphor, though the president recently discounted it, much to his advisers’ private distress, I would imagine. This is the metaphor we want with North Korea: rapid denuclearization on their part and giving up all their weapons. And I think that's why we've got a problem with metaphors. The Trump administration keeps talking the Libyan metaphor. The North Koreans were talking the Soviet/United States negotiated metaphor. Very different metaphors. Q: Like the India-Pakistan tension, Israel itself was born after World War II and finds itself in the headlines, with the U.S. embassy there getting relocated to Jerusalem. Can it work? A: I would argue that any move you make in that regard has to be measured against the following yardstick: “Does this move us closer to a two-state solution between the Palestinians and the Israelis and the longer term stability in the region?” I do not see any way, shape or form that the U.S. declaring our embassy in Jerusalem moves that yardstick in that direction. In fact, I see it moving the yardstick in the opposite direction. Anybody who’s followed this region for a long period of time probably would accept the notion that eventually Jerusalem is going to be the capital of Israel. But people, particularly Palestinians, have believed that eventually the two-state solution would require that a capital for some state called Palestine would be in East Jerusalem. So it's not where the American embassy in Israel is going to be; it's where the American embassy in Palestine might be that’s the question. And from Palestinian perspective, that possibility has now gone out the window, even though to their credit, the Trump administration, when they announced this, were nuanced enough to say this doesn’t necessarily define the final geography of the city of Jerusalem. The U.S. has been trying to portray itself for many, many years and multiple administrations, Democratic and Republican, as the honest broker, somewhat evenhanded, between Israel and the Palestinian Authority in terms of trying to find that elusive agreement that will allow a two-state solution to occur. So in the aftermath of this decision, at least from a Palestinian perspective, there's no way that the United States can portray itself as an honest broker. They firmly believe that the U.S. has clearly sided with the Israelis. Now the last thing I'll have to say is, there’s a lot of the violence going on as a result of that particular announcement. But that violence was instigated to a degree by Fatah and Hamas, the two groups representing the Palestinians. They also have a certain degree of responsibility here as well. We can't and shouldn't ignore that for a minute. And then of course Mr. Trump will always describe himself as the grand negotiator and a master of the art of the deal. So my only question to him if he was sitting right here is, “What did the United States get for moving the embassy to Jerusalem? Did the Netanyahu government announce some major concession that might move the negotiations toward a final solution? Did they talk about moving settlers out of the West Bank, so a territory called Palestine could be defined?” As best I can tell, the president got nothing for this except frankly some goodwill from the Israeli government and in particular President Netanyahu. To be fair, President Trump promised during the campaign that this is one thing that he was going to do, and so domestically, I guess it helps Mr. Trump in terms of domestic politics with his base. But I don't see where the president got anything from it internationally. In fact, I think President Trump moved the issue of peace in the Middle East light-years away from a final solution and therefore increased the chances of continuing violence. Q: And moving on, Iran and another bombshell issue: President Trump pulled the U.S. from the Iran nuclear deal. What are your thoughts on that? Everybody says the Iran agreement, or JCPOA [Joint Comprehensive Plan of Action], was an imperfect agreement, and in my time working in diplomacy, every agreement that two countries have agreed to was imperfect for the both sides. The only perfect agreement was the one we saw with the Japanese, on the deck of the U.S.S. Missouri, where they did an unconditional surrender. That was a perfect agreement for the U.S. But absent that, they are always imperfect, to say the least. But what did the Iran agreement do? It kept the Iranians from moving forward to the acquisition of a nuclear weapon for a period of roughly 10 to 15 years and put in place a pretty stringent verification regime to ensure that they didn't do that. Critics would say, "Well, it didn't affect their ballistic missile program or their support for terrorism throughout the region." And the answer is that's absolutely true, and the agreement was never intended to. It was intended to be a narrow-focused transaction on nuclear weapons development. And furthermore, critics will say, "Well, they've intensified their activities in the Middle East and supported terrorist organizations like Hamas and Hezbollah." And that's true too. But again, the focus of this agreement was that narrow nuclear arena. Not unlike agreements we signed during the Cold War with the Soviet Union that limited nuclear weaponry. But at the same time the Soviets supported communist groups in Angola, Vietnam, Latin America and elsewhere around the world. So in Iran, that's what the JCPOA was meant to do, and that's what it was doing pretty doggone well, because all the verification reports from the IAEA charged to verify Iranian compliance said that they were in full compliance. Just walking away is not a strategy. What is the strategy now? This was a multilateral agreement that involved not only the United States but the Chinese, the Russians, the British, the French and the Germans. We’re all signatories. There is no compelling reason to believe that because we walk away from it that all those folks are going to walk away from. In fact, I seriously doubt that they will, and so far they have indicated a desire to maintain the agreement. So in the aftermath, what have we done? We've isolated ourselves from the rest of the world. And back to the North Koreans for a minute. If you're North Korea and you watched the United States negotiate this Iran agreement about denuclearization and then a year later walk away from that, why would you negotiate with the United States and give up all your nuclear weapons? You'll hear arguments from the administration, which I think are somewhat opaque, that this [Iran move] somehow makes the negotiations with the North Koreans easier. It’s very difficult to understand, but that's what they claim. And since we're not just stopping a program in the North Korean case—you're getting rid of existing weapons—Pyongyang would have to agree to a much more stringent verification regime than what was in the Iran deal. Consequently, it’s very difficult to believe that Kim Jong Un will give up all his nuclear weapons unilaterally. And then, would the most hermetically sealed country on the planet earth open itself up to the most wide-ranging verification measures one can imagine to ensure they still aren't hiding a nuclear weapon or developing one somewhere? That to me is an enormous leap of faith, and if Mr. Trump can pull that one off, he deserves the Nobel.